Camden Monument Place offers the ideal lifestyle complete with personalized service and sought-after amenities in Fairfax, Virginia. Our studio, one and two bedroom apartment homes and lofts were designed with upgrades featuring crown molding, French doors, and fireplaces. Come in for a visit to see our newly remodeled apartments featuring beautiful dark modern cabinetry, granite countertops, upgraded stainless steel appliances, brushed nickel fixtures, hardwood-style flooring, rainfall showerheads, LED lighting, USB outlets, washer and dryer in every unit and more! Our wide array of available floorplans offer unique features like kitchens with islands and breakfast bars, stainless steel appliances, granite countertops, large balconies, kitchen pantries and linen closets. We’re passionate about finding your perfect new home at Camden Monument Place. Invite friends over to relax poolside on our sundeck with WiFi or play a game in our resident lounge with billiards. Break a sweat in the fitness center, while the kids work out their energy in our play zone. Enjoy the additional convenience of retail shops just steps from your apartment, covered garage parking with reserved spaces and climate-controlled storage in varying sizes. 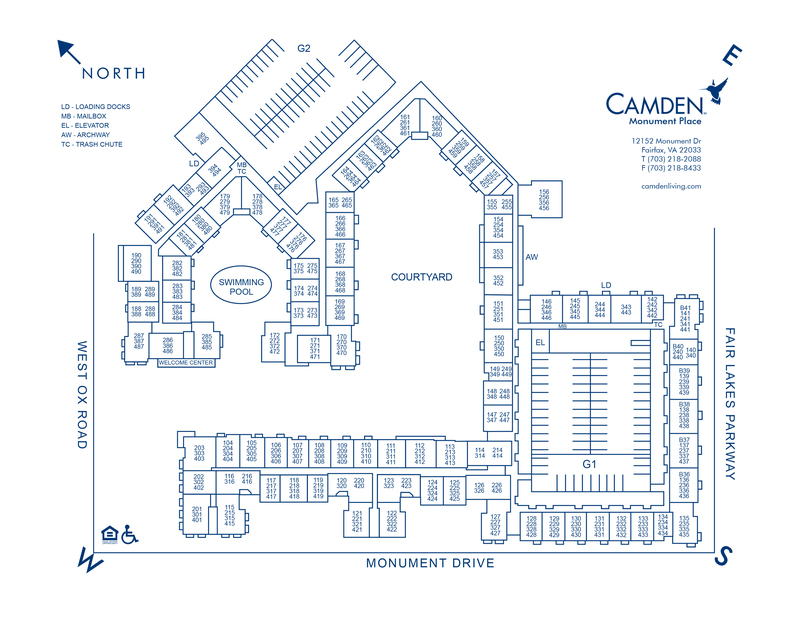 Camden Monument Place delivers the convenience of access to I-66 and Fairfax County Parkway. Adjacent to shopping and just minutes from Regional Fair Oaks Mall, Fair Lakes Shopping Center and Fairfax Corner, as well as entertainment venues like Patriot Center at George Mason University makes life easier at Camden Monument Place. Come home today! We'll save a spot for you! We offer one parking permit per apartment home in our parking garage. Additional parking permits are available for $35 per car per month. Residents may reserve parking spaces for $60 per car per month.